James Randall Morris, age 72 of Pikeville, passed away Sunday, February 10, 2019. Randall was a carpenter and farmer all of his life. 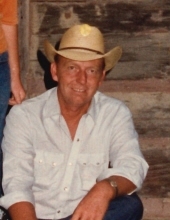 He enjoyed riding horses, hanging with his family, attended New Harmony Church of Christ when able, and was a veteran of the United States Army. Randell was preceded in death by his wife, Jackie Morris; parents, James Michael and Kathleen Brown Morris; special child, Amber Everett. Survivors include his sons, Jimmy (Christie) Morris, Lee (LeeAnn) Morris; special children, Sandy Holland and Crissy Everett; grandchildren, Mike, Katie, and Jessie Morris, Autumn Cooley, Luke and Ty Morris, Chase (Chas), Seth (Geordan), and Drake (Kaitlyn) Brown, Alana, Kamry, and Jenna Holland, Shayla Loyd, Caylin Bledsoe; great-grandchildren, Brice Frady, Cole, Blake, Carter, and Mason Morris, Tallen Harvey, Saylor, Blaise, and Ricki Brown; several nieces, nephews, cousins, and a host of friends. A graveside service will be 10:30 am CST Monday, February 11, 2019 at Smyrna Cemetery with Bro. Gary Everett officiating. The family will receive friends at his residence after 5:00 pm CST Sunday, February 10, 2019. Condolences can be made at www.pikevillefuneralhome.com. Pikeville Funeral Home was entrusted with arrangements. "Email Address" would like to share the life celebration of James Randall Morris. Click on the "link" to go to share a favorite memory or leave a condolence message for the family.